Your details are secure and never shared. You can opt out at any time. Whether It’s giving you a subtle brow lift to take a few years off and enhance the eye area, replacing missing ends of your eyebrows, or simply adding hairs to sparse areas, I can create and perfectly redesign a new brow style just for you regardless of age, face shape or skin colour. There are many reason why people chose to have permanent makeup some are cosmetic to enhance your beauty and confidence and some are due to hair loss caused by medical conditions such as cancer or alopecia. However at the end of the day its a personal choice for you and is something you feel a need for. Here is a selection of reasons that other people have mentioned why they had permanent makeup. Have beautifully applied makeup every day and every night. Never worry that you are going out without your makeup on. Have a more youthful looking face. Save time you would normally be spending applying and re-applying your makeup. A beautifully placed arch in your eyebrow can take years off your face. Never have a bad makeup day again. Never have to get up earlier than your partner again to quickly put on some makeup. No more worries about going to social events or activities like swimming, hiking, biking, tennis, aerobics, because you were afraid that someone might see you without your makeup. Never have to hold back from hugging a loved one in case they end up wearing your eyebrows. Never have your eyeliner run again, even if you cry at a wedding. Never leave lipstick on his collar. Always look fresh and ready to go. Wake up looking as good in the morning as you did in the evening. Never worry about having an allergic reaction to makeup again. Gives you the freedom and convenience of not having to have a daily makeup application. Look your very best ALL of the time. Is Permanent Makeup Safe, Will it Cause Allergies? Before any treatment occurs you will be invited along to a completely free consultation session. During this session we will ask you about your medical history, any problems and illnesses you may have, or have had, and if you are award of existing allergies. Either before or during your consultation we will carry out a patch test. The patch test is simply adding a small amount of pigment to your skin to see if there are any allergic reactions. It is very rare to get a reaction to the pigments that we use as they are completely hypo-allergenic and have been specially formulated through years of research and development using only the finest grades of oxides and lakes, and are the same ingredients found in products from major brands such as Lancome, Estee Lauder, Shieseido, Truco, Guerlain, MAC, Channel, and Gucci cosmetic products. Can I be Infected By Poor Sterilized needles? All of the needle housing and needles are completed disposed of after each treatment. We NEVER reuse any needle that has not come directly out of its sterilized packet, and each needle is placed into the pigmenting handset without being touch by the technician. 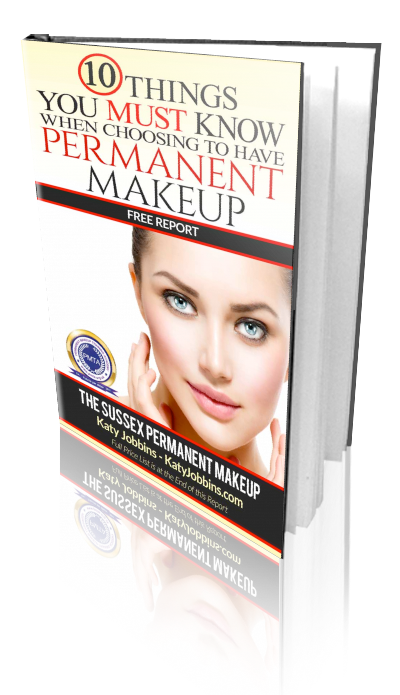 Is It Possible To Correct Poor Permanent Makeup? If you have had your permanent makeup done elsewhere and have a wonky lip line, orange or pink brows or an uneven shape then don’t despair! action to make you love your permanent makeup again. Call us now on 01444 300157 and book in for a free no-obligation consultation today. What Colour Will Best Suit Me? During your initial consultation we will discuss makeup colours that you currently use and take into consideration your hair colour and skin tone. As you can imagine there are many different skin tones and hair colours so each client is treated individually and the colour will be selected jointly with you to get the best match for your individual needs. Can I See Your Existing Work Portfolio? Eyelash Enhancement thickens and defines lashes with minute dots of lash colour, attracting more attention to ‘bare’ eyes. Ultra subtle, ultra pretty. Permanent Eyeliner is the ultimate way to wake up with beautiful, perfectly-placed eye definition. 100% Stay-put eye makeup. Natural but noticeable. Replace naturally receding lip colour with a newly perfect shape, increasing the volume for the perfect pout. So natural, only you will know. My Face Is My Fortune, This Cant Go Wrong! The Average Woman Spends Up To 122 Hours A Year Applying Eyeliner!! !